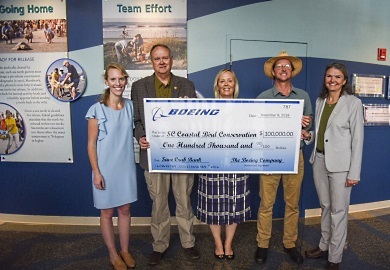 Today, Boeing South Carolina announced it would donate $100,000 to aid fundraising efforts to restore Crab Bank in the Charleston Harbor, critical sea and shorebird nesting habitat that has significantly eroded in recent years due to wind, waves, and storms. More than a year ago, the state’s Department of Natural Resources (SCDNR), local outfitter Coastal Expeditions, and members of the conservation community (Audubon South Carolina, the Coastal Conservation League, and S.C. Wildlife Federation) united to save Crab Bank. The U.S. Army Corps of Engineers is currently dredging as part of the Charleston Harbor deepening project and can use sediment from the harbor to restore Crab Bank. It’s a viable option that requires a local match of about $1.5 million by December. To date, and with support from Boeing South Carolina, the effort has raised more than $365,000 for Crab Bank’s restoration. The island is an economic driver for Shem Creek, a vibrant working waterfront, and it contributes to coastal tourism, outdoor education, and scientific research. Every year, more than 10,000 people rent kayaks from outfitters on Shem Creek and paddle to the bank, joining others with personal boats and stand-up paddleboards to see birds nesting - a rare and unique experience on the Atlantic coast. To learn more about the South Carolina Coastal Bird Conservation Program, its effort to save Crab Bank or to donate to support the island’s restoration, please visit sccoastalbirds.org via the link below.